A couple of weeks ago Apple introduced their new iPhone. There was endless video of people camping out in line, followed up by breathless reports of fantastic sales figures. One million phones sold in one day! Wow! Interestingly, no media outlet pointed out that in 2007, Nokia sold an average of 1.19 million phones a day every day of the year. Of course there were a few worms. The first few days Apple stores and AT&T couldn't unlock the software to turn the phone on. A small problem, but hey, you have the new iPhone, you should be happy! Then there were those pesky problems with MobileMe; seems that having the phone turned on was no guarantee that it would actually do what Apple said it would. Well, it only affecting 1% (10,000) of you. Get over yourselves! The tomato tree still stands, though the base has developed some worrisome rust. The legs are, precariously, holding on. The Better Boys are ripening quite quickly. The Brandywines are lagging; I'm not sure we'll see any this year. Interestingly, my non-tomato tree plant is doing quite well, with none of the blossom end rot displayed by the upside-down tomatoes. They were planted the same day using the same new dirt. 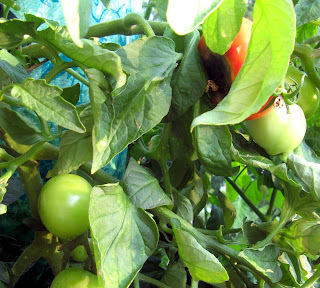 They've been treated exactly the same, (except for the fact that the Tomato Tree plants require much more water). 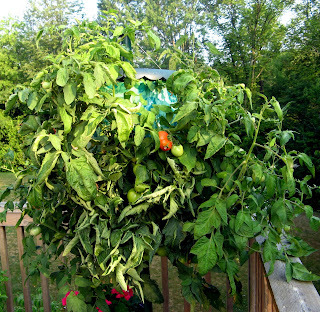 "The Tomato Tree eliminates common pests and diseases". "The Topsy-Turvy gives you up to 30 lbs. of fruit per plant" - I'll be lucky to get 10 lbs. "The Topsy-Turvy eliminates backbreaking work" - Unless you're under it when your taking it apart to ship back. Hype and hubris. The beat goes on. Or at the very least the next Bond Girl! Love the first comment, I need to find a place to use that as a screen name. 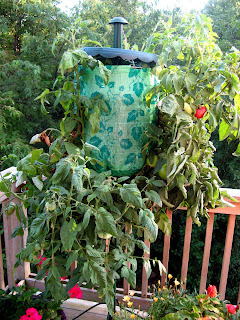 I bought some fairly expensive self watering pots after years of growing tomatoes in the cheapest crappy plastic pots I could find as Kmart, which were left behind from teh previous owner of the house and looked terrible. The tomatoes did terribly in them! They produced a lot less and didn't have as much flavor (even my husband said so). After telling myself for three years it wasn't the new pots (just that year, my watering, the plants I used, etc.) I bought $1.99 pots at Meijer and my tomatoes are doing great this year. My advice is to get the thinnest plastic pots you can find.